Calling these prisoners “political” is a gross misrepresentation. Among the prisoners whose release was demanded was Kozo Okamoto, a Japanese Red Army member on contract for the Popular Front for the Liberation of Palestine when, on May 30, 1972, he was part of a team that fired machine guns and threw hand grenades at passengers arriving in Tel Aviv on an Air France flight, killing 28 and wounding 76 (Encyclopedia of Terrorism and Political Violence, John Richard Thackrah, p 141-2). 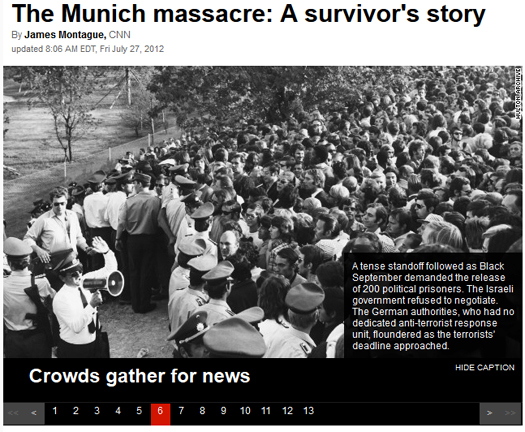 Does CNN really consider the killing and wounding of scores of civilians a political act? Another name on the list was Andreas Baader, of the Red Army Faction, convicted of the arson bombing of a Frankfurt department store. Ulrike Meinhof, Baader’s comrade in the RAF, was another whose release was demanded. She was charged with numerous murders and the formation of a criminal organization. Again, is “political” the correct terminology for this activity? 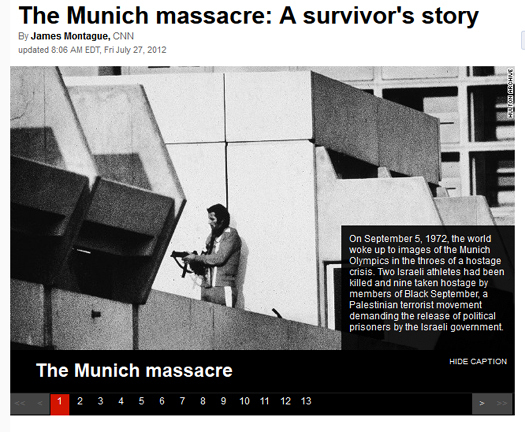 In a separate matter, the article inexplicably accepts without challenge a false claim from IOC president Jacques Rogge that “There has been no pressure from any nation for a minute’s silence.” In fact, Israel has mounted a months-long campaign for the IOC to include a minute of silence, as reported here by CNN. That story, by Greene, rightly noted that “President Barack Obama supports the campaign, the White House said Thursday.” In addition, readers should have been informed that many members of Congress support the international public campaign (a petition garnered more than 107,000 signatures) for a moment of silence, as do the German Bundestag, the Canadian and Australian parliaments, and 50 members of British parliament. Stay tuned for updates about a correction.